You know how sometimes you’re in dire need to capture a picture immediately but your hands are occupied and trying to take a picture with one hand can be a little tricky? No problem, Google has just rolled out an update to its Google Search app for Android that allows you to capture pictures and videos using the “OK Google” command. For those who have an Android device running on Android 4.1 or higher, the next time you wish to take a picture or a video, just open the Google Search app on your phone and activate Google by saying “OK Google” followed by “take a photo” or “take a video”. Google will launch the camera app on your device and do as told, it will even open your preferred mode so it can capture whatever you want exactly the way you want it. 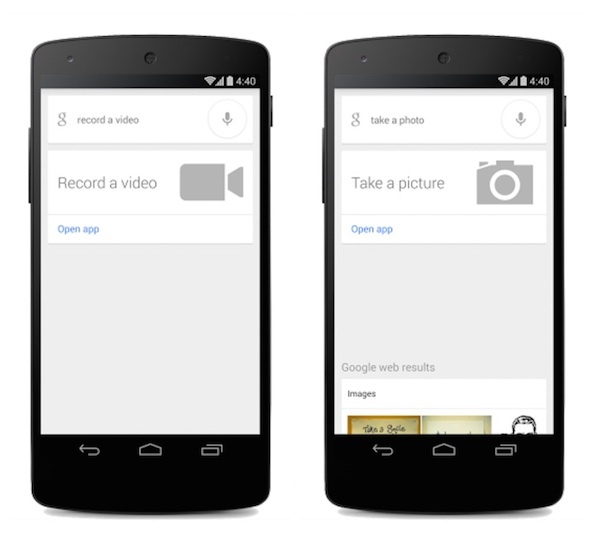 Sadly, taking a picture or video does not exactly take them, Google will only activate your camera app in the respective mode but you’ll still have to tap on the shutter button yourself to actually capture something. For those who are not keen on opening the search app and talking to your phone like a weirdo, you can always use the conventional method of tapping the camera app instead. Nonetheless, it’s great to see Google constantly improving its voice command capabilities and let’s keep our fingers crossed that they’ll bring in more commands in the near future, you know, so your future Android Wear device will be even better than what we’re seeing now.